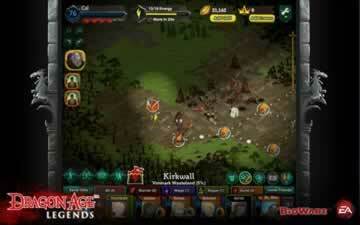 Dragon Age Legends Game - Download and Play Free Version! Fight Fearsome Monsters as You Uncover the Mystery Surrounding the Viscount's Son! Thirteen years have passed since Kaiten’s previous ruler, Viscount Khedra, was found to be possessed by a Pride Demon and deposed of. Since that time, the city-state has lived in relative peace and prosperity under the rule of its new viscount, Ravi. Unfortunately, not everything can last. In light of the most recent Blight, the malevolent Darkspawn have begun to appear in the Free Marches. Worse, they’ve surrounded the lands owned by Ravi’s son, Eiton. As one of the viscount’s most trusted lieutenants, it’s up to you to fight your way through the Darkspawn horde, find out what’s happening, and rescue Eiton. Dragon Age Legends marks another chapter in Bioware’s popular Dragon Age RPG series. It tells an all new standalone story starring a brand new hero: you. Play as one of three classes: warrior, mage and rogue. Customize your appearance, name and war cry. Level up to improve your character’s statistics and learn dozens of different skills. Become a master swordsman, pyromancer, archer, dirty fighter and more! Gather and purchase powerful weapons and armor to alter your appearance and improve your combat effectiveness. Recruit an entourage of allies to assist you in the many fights to come. Try out completely new characters or invite your favorites from the Dragon Age series, including Isabella, Shale and Morrigan! Collect unique pets to assist you in battle, such as a Mabari war hound and even a dragon! Fighting is a way of life in the Dragon Age universe. There are many hostiles between you and Eiton, and it’s going to take a lot of strength, strategy and guts to defeat them all. Fight strategic turn-based battles against bandits, Darkspawn, dragons and more! 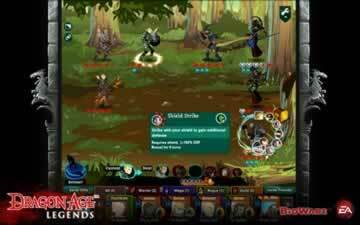 Form a party of up to six people to fend off wave after wave of enemies. Use spells, talents, bombs and potions. Unlock raids to fight challenging optional battles that will put your tactical skills to the test. Thanks to your years of loyal service to the viscount, you will be granted a personal estate. This will act as your base of operations and provide a bevy of services that will help you on your quest. Customize the look and appearance of your estate. Purchase an assortment of rooms and facilities, each of which has a different purpose. Buy an apothecary to brew potions, an infirmary to craft kits, and more! Hire workers and set them to make potions, bombs, kits and more. Dragon Age Legends offers a bite-sized RPG experience, complete with tactical battles, a character-driven narrative, and limitless ways to build your avatar. Best of all, it does it all for free. 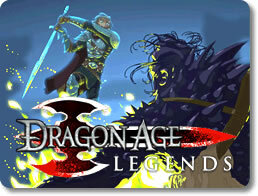 If you’re a fan of Bioware’s epic series or are looking for a little fantasy adventure, get Dragon Age Legends.